I do a lot of annual educational evaluations in Santa Rosa County. I am Charles Curtis Tucker. 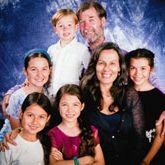 I have been a homeschooling parent since 1999, a Florida certified teacher since 1996, and I have been a homeschool evaluator and approved test administrator for Santa Rosa County since 2003. I am currently a Florida certified teacher with a Florida State Department of Education certificate which expires on June 30, 2021. Scroll Down for more detailed information.